Goodie bag includes an eco-friendly tote, makeup pouch, inflatable beach ball + frisbee, and temporary tattoos! 2. Share this giveaway on your blog, facebook (share the photo) or twitter by tweeting the photo with the giveaway prizes using the phrase "I want to have a sweet summer with Chocolate Clothing! 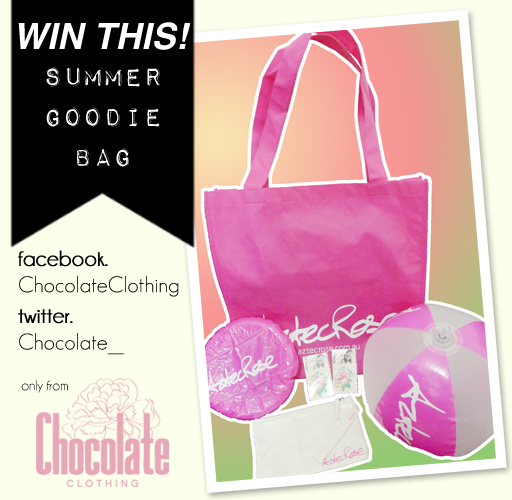 Get a chance to win a summer goodie bag http://goo.gl/UfxpL #ChocolateClothingSummer"
3. Leave your name, your email and tweet URL below. Double your chances of winning by also joining Chocolate Clothing's contest on our Sugar Rush blog! Same prizes! Click HERE! *This promo is open to Philippine residents only.